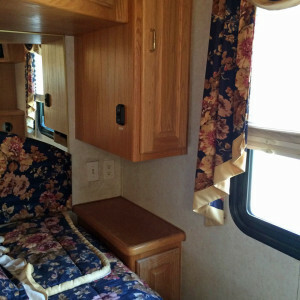 As I mentioned in a previous post, my husband and I are preparing to sell our house, buy an RV, and live full time on the road for a while. There's so much to do to prepare. We need to flesh out our preliminary itinerary. We need to gather insurance information and research internet providers. We've got to start culling our belongings soon so we can keep only the essentials in a storage unit. And then there's buying the RV itself. We're pretty sure we're going to get a used Class A Diesel, between 38' and 40' long. We don't want to have to buy a vehicle with the power needed to pull a large trailer or a 5th wheel, and we feel like a Class B or C are going to be too small for our full-time-working lifestyle. Gas and diesel motorhomes have their advantages and disadvantages, but since we're planning on traveling constantly, we want something with durability and lots of reliability — plus used diesels wear their mileage more gracefully than used gas models do. So we've got it narrowed down to a used Class A Diesel pusher, as I mentioned. Sadly, this really doesn't narrow it down at all. 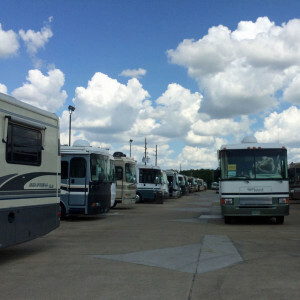 We toured a consignment lot full of used RVs today and started picking out elements of floorplans we like to start figuring out a direction, and possibly even some makes and models of choice. 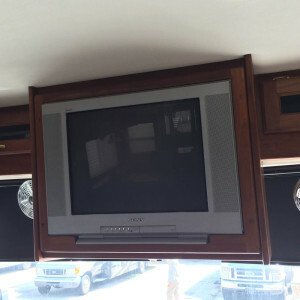 Televisions should be visible. We don't really watch all that much tv, but we feel like we shouldn't have to crane our necks to see the screen. Most setups were fine, but a few of them had the tv on the floor between the driver and passenger, making it tough to see from the couch. Backup cameras should be easy to watch. And side view cameras would be nice, too! Until we bought our RAV4, the largest vehicle I'd ever driven was a Ford Contour. I'm now used to our small SUV, but a 40'-long RV is something else entirely. These cameras are gonna save my tush. I'm a Southerner, so I love me some screen doors. The idea of being able to let the breeze in but keep the bugs out is really appealing. 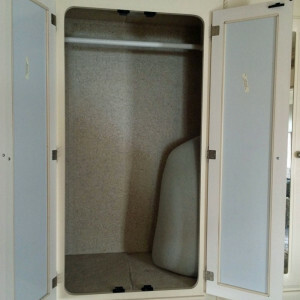 Even if the RV we get doesn't come with a screen door, I may look into adding this. 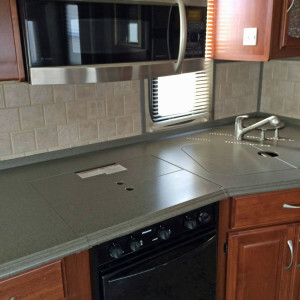 No RV kitchen is going to have as much counter space as my house, but some of these are pretty impressive. More counter space is better. 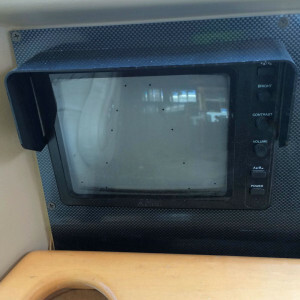 Also, it seems like most RVs have a combination microwave and convection oven, but some (like this one) have both, so that would be nice to have, especially when cooking for guests. 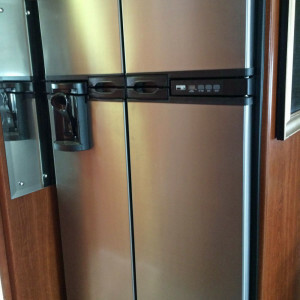 I'd rather sacrifice some storage space and get a bigger fridge and freezer. Fresh food is important to me, so I need to be able to keep plenty of it. Besides, you can't just find Blue Bell ice cream anywhere. I may have to stock up. 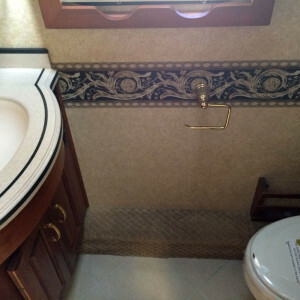 Ever since we toured Meriwether, Eric and Brittany Highland's RV, I've been wanting one with three sinks: one in the kitchen, one in the bathroom, and one in the lavatory. Even in our house, we don't have a his-and-hers sink setup, so if we can get this in an RV, it'd be a step up. And fewer elbows in the face when trying to brush teeth. Ample hanging clothes space is important to me, as is a washer/dryer. It's not that I'm planning on bringing that many clothes with me, but I really don't enjoy ironing, so when I get something pressed, I don't want to have to fold it, unfold it, and iron it again. Really, this is about me being lazy. I need room for all my hiking clothes! This may seem silly, but I'd really like a decent-sized bedside table on both sides of the bed (which should be queen size, by the way). I hate fumbling for things in the night and not being able to find them. Water? Check. Clock? Check. A good book? Check. 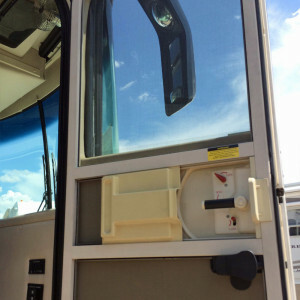 What are the features you'd want to see in an RV? Have any thoughts on makes and models that would be perfect for us? Let us know.